Teddy bear clothes, teddy bear boy jackets and coats clothes fit boy build a bears factory teddies. Compatible fit for 14-16" build a bear and many more popular brands. Probably the best selection of Teddy bear clothes you have seen! Blue raincoat with matching boots and hat. Both the coat and boots are reversible to the blue print. Fits Build a Bear, Argos Design a Bear plus many more similar shape size bears. Teddy bear clothes Green Duffle Coat Jacket. Service jacket. Compatible to fit for Build a Bear, Argos Design a Bear and many more teddies of a similar shape and size. 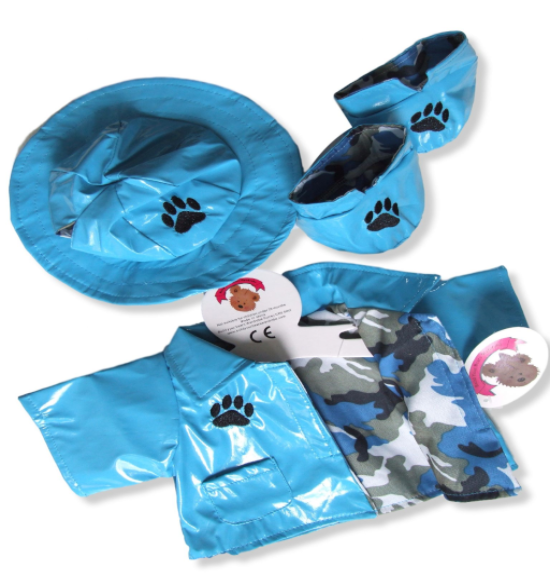 Fishing outfit a compatible fit for Build a Bear, Argos Design a Bear and many more teddies of a similar shape and size.